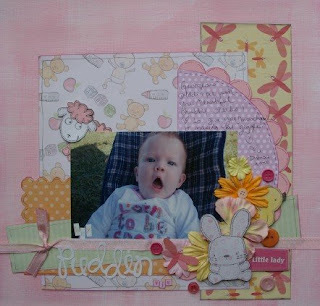 Gorgeous layout Krissy!! That baby is such a cutie!! :) Your cards look so fabulous too!! What fun! Those cards are gorgeous and the papers in the baby layout remind me of fabric my mother used to sew stuff for us when I was little. Have a wonderful weekend away Krissy and fingers crossed for the pink camera. Thanks for such a cute layout this month and I am loving those cards! Great work!! !